The relationship between parents and clinician is critical to the care and treatment of children with life-limiting conditions (LLCs) and life-threatening illnesses (LTIs). This relationship is built and maintained largely in consultations. In this article we lay out factors that bear on the success of clinical consultations and the maintenance of the essential clinician–parent relationship at progression or deterioration of LLCs or LTIs. We suggest an approach to engaging parents in conversations about care and treatment that recognises and appreciates the dilemmas which clinicians and parents face and in so doing provides a way for everyone to live with the decisions that are made. A close analysis of a consultation at progression and excerpts of encounters among parents, clinician and researcher are used to illustrate our approach to research, analysis and development of recommendations for clinical practice. Medicine advances; children live longer. Some are cured of diseases which were thought to be invariably fatal. As treatment options increase so do the choices and decisions that need to be made. Depending on the decision taken, harm may be done and suffering may result. Parents and clinicians must live with the decisions they have made. Critical to decision making is the relationship between parents and clinicians. This relationship is built and maintained largely in the consultation. In this article we lay out factors that bear on the success of clinical consultations and the maintenance of the essential clinician–parent relationship at progression or deterioration of life-limiting condition (LLC) or life-threatening illness (LTI). We suggest an approach for clinicians to use in engaging with parents in such conversations about care and treatment that recognises and appreciates the dilemmas which clinicians and parents face and in so doing it provides a way for everyone to live with the decisions that are made. A close analysis of a consultation at progression and excerpts of encounters among parents, clinician and researcher is used to illustrate our approach to research, analysis and recommendations for clinical practice (figures 1 and 2). ‘A very difficult scenario’: case summary. Steps to be taken to prevent impasse in the consultation and breakdown of the parent–clinician relationship. In applying this approach to the complexity of consultations, we identify problems that can occur in difficult interactions and how they can be addressed taking into consideration all perspectives. The approach, applied here to a case of a child with a brainstem glioma could also be applied to difficult decisions in the newborn period, intensive treatment unit, or indeed in any facet of medicine that involves decision making among parents, clinicians and in some cases children as well. Our approach to research is an in-vivo one. We capture events as they unfold and record conversations as they take place. Research begins with embedding the researcher(s) in the clinical teams, establishing themselves as participant-observers. They immerse themselves in the everyday lives of children, families and clinicians—following them in hospital, hospice and patients' homes over the course of the illness. In time, both clinicians and families find their presence, wherever it is, unremarkable. The researcher is present in as many venues in which care and treatment of children take place as possible. Researcher(s) attend consultations, family and multidisciplinary team (MDT) meetings, ward rounds and home visits by healthcare professionals. They are present in waiting rooms and talk with parents and clinicians before and after consultations, rounds and MDT meetings. All of these interactions, including the open-ended, semi-structured interviews conducted at the close of each case are audio-recorded, transcribed verbatim with non-verbal behaviours inserted into the transcript. Fieldwork is conducted continuously over a relatively long period (9 months to 2 years). Following the practise of a cultural anthropologist, the researcher(s) grasp the participants'—patients, parents and clinicians—individual understandings of ideas and issues. Thus, when investigating a parent's understanding of treatment options, the researcher(s) construct the parent's point of view from the recorded and observed conversations. In taking an ‘in-vivo’ approach, problems of inaccurate or distorted recall from retrospective interviewing are avoided. The complex interchange is documented as it unfolds. Researchers capture the different perspectives of the multiple participants in an interchange. By following MDT meetings and ‘corridor chats’, for example, differing presentations of information to parents from different sources can be tracked. Key to understanding decision making with seriously ill children is the roles which parents and clinicians occupy in their lives.1 ,2 ,4 A role is something constitutive of one's identity and sense of self. It significantly affects how we conduct ourselves in interaction with others and how we feel about those interactions. Part of the role of a parent is to protect and advocate for their child. This begins with learning at diagnosis how to navigate the healthcare system. Advocating can take the form of dealing with options for treatment. Protecting involves weighing the risks which they present. Driven by the need to leave no stone unturned, parents' advocacy is tireless. Just as parents have a socially defined role which comes into play in decision making so too do clinicians. One important way clinicians perceive themselves, and how society perceives them, is as professionals trained to treat.9 A second perception is that they are ethical practitioners who will recommend within their realm of expertise what is best for their patients. One of the compelling understandings of a child in Western society is as a being with a future.1 ,5 This is the norm. Often a child with a LLC or LTI challenges such notions and our constructions of what children are. The diagnosis of a LLC or a LTI is an assault on the child and family.2 Receipt of such a diagnosis, or news of progression, is simultaneously numbing and overwhelming. Plans, roles, duties, obligations and priorities change to accommodate care and treatment. This challenge reappears at each relapse, at each unmet developmental milestone. The parents' ability to protect and to advocate for the ill child and for siblings is constantly being tested. Parents push back against the invasion of the disease into their lives.2 They respond to challenges while trying to preserve what they can of their normal way of life for as long as possible. 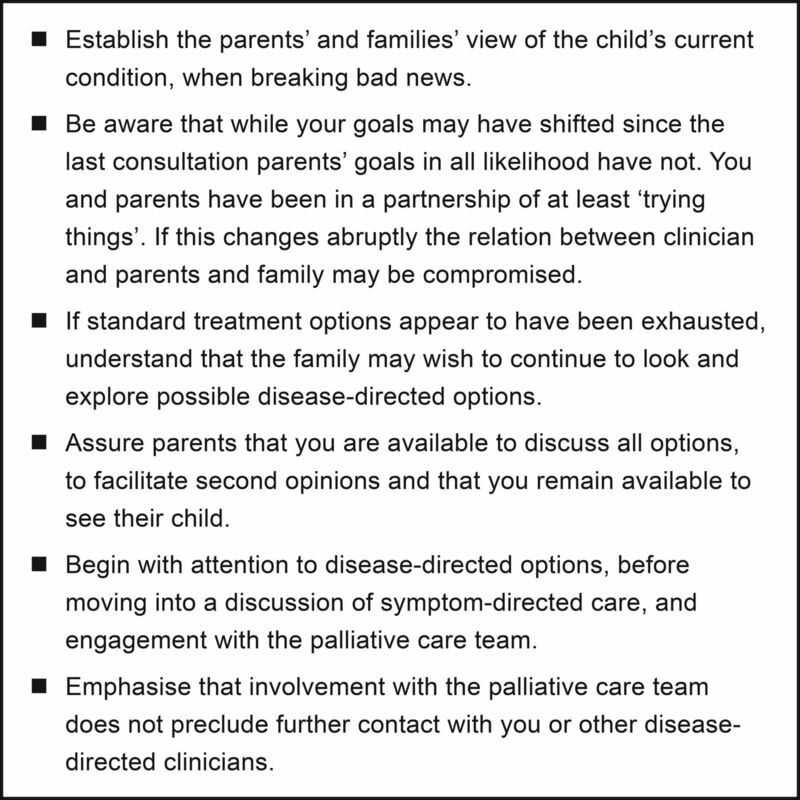 Parents use several strategies to: manage the tasks of care, process information about the disease and the child's condition, assess and address priorities in the family and conceptualise a future despite the prognosis. The strategies allow them to live for a period of time with some sense of normalcy and control. The strategies change over the course of the illness. For example, in the case of children with cystic fibrosis, when the child is doing well, the parents talk about a future through adulthood, marriage, children and a job. When the child's condition is deteriorating, the future is reconceptualised to a shorter frame—secondary school, dating perhaps. When the child is doing well, information about the possibilities of gene therapy come to the forefront and the possibility of death goes to the back of one's mind. It is not forgotten but neither is it the focus. Parents and siblings engage in a redefinition of normal. The definition of what constitutes normal is altered to accommodate the child's changing condition and family life. The impact of serious illness changes over time. Each disease has its own biosocial illness trajectory marked by transitional, significant disease-related events.1 ,2 Within each stage of the trajectory there are changes in the child's condition and in individuals' views of themselves and of the ill child. Transition to a new stage in the illness trajectory affects the way in which ill children, their parents and siblings think about the disease and themselves. For healthy siblings of children with cystic fibrosis, for example, as their ill sibling moves along the illness trajectory, their descriptions of their sibling's disease become less optimistic and they use more qualifiers. Eventually, especially as other ill children whom they know or knew die, their conversations reflect awareness that the death of their sibling is likely or imminent. Thus, the way in which family members apply concepts such as prognosis to the ill child is a function, in part, of where they and their child are, on the illness trajectory. The relationship between information conveyed to patients and families in consultations and decisions made is complex.4 On the basis of statements and actions of parents in consultations, preliminary analysis revealed no association between parents' understanding that there was no cure for their child and whether they pursued further disease-directed options. Why do parents search when the odds of finding anything, and the odds of success with anything which they might find, are so slight? Parental focus is on that particular child to whom they bear a unique responsibility. They must apply the information from the clinician, at a population level, to one individual, their child. If they are shown a survival curve, parents seem to realise that their child could occupy any place on that curve. As one mother said: If I decline treatment for him I have denied him that chance. The odds of a child's responding to treatment or being cured are not by themselves determinative of parental choices. Parents may accept very small odds as worthwhile. Continuing the search for disease-directed options is crucial to parents. For example, we found that most parents pursue treatment in the weeks or even in the days before the child's death.4 By pursuing we do not mean that they necessarily are administering treatment, rather they are continuing to look for treatment. Parents may do this themselves or ask their consultant to do this or both. Parents throughout the disease embrace both disease-directed and symptom-directed goals. This dual pursuit is a reflection of the multifaceted roles which they occupy. Parents have their own views of their child's status and well-being.4 ,8 These may differ from those of the clinician. As the disease progresses, clinician and parental assessment of the child's condition may diverge. A clinician may see the child as declining but the parent normalises the child's condition. As one mother put it, her son was a ‘healthy sick kid’ and should be treated as such. The parents' construction of the child and their interests are different and perhaps wider than that of the clinician. The parental view may be driven by factors which the clinician cannot alter, but can understand. An upset mother leaves the consultation (see figure 1). She has been told that her daughter's tumour is growing, that there is no more treatment and that the child, who appears stable to her, will deteriorate and will likely die within a few months. After the consultation, the doctor says to the researcher, ‘Unsatisfactory’ ‘Absolutely terrible’. ‘Hopeless’. He states that, “I haven't been able to address very many issues, you know, they're upset”. At the neuro-oncology MDT meeting the following day the clinician describes the event to his colleagues as ‘a very difficult scenario’. A sibling says, “So, are you just going to keep us with her until she just passes away?” The clinician responds that, no, not at all, the child will be supported. The mother, siblings and the clinician are disturbed and dissatisfied with what has happened during the consultation as well as the situation. Their frustrations can be understood by appreciating that each is pulled simultaneously in different directions. They need to respond to the demands of competing roles without totally neglecting one side or the other. They need to do this for themselves and for maintaining their relationship with one another as well as for carrying on with caring for the child. The mother's paramount task is to advocate for her child. In hours of recorded conversation, she speaks favourably at various points of those who have ‘helped’ or might help her daughter. That is what she seeks. Clinicians regard themselves and are regarded by others as trained to treat.9 This clinician has nothing to offer. He has asked colleagues, they offer nothing. He conveys this to the family. The adult siblings raise questions about the availability of treatments in other places. The family understands what they have been told, but as their expectation is that a clinician will treat, they try to continue to interact with him in terms of the way in which they understand his role. The imperative to treat is in tension with a second dimension of the clinician's role: to protect the child's interest and do no harm. For the clinician the overriding interest of the child now lies in providing the supportive care she will require over the coming months. The family recognises that the impetus to ‘try something’ is balanced against the impact of therapy on the child. But they still wish to explore disease-directed options, including clinical trials. At the outset of the consultation, the mother and siblings, on the one hand, and the clinician, on the other hand, are intent on pursuing one of the two opposing sides of the roles which they each occupy. 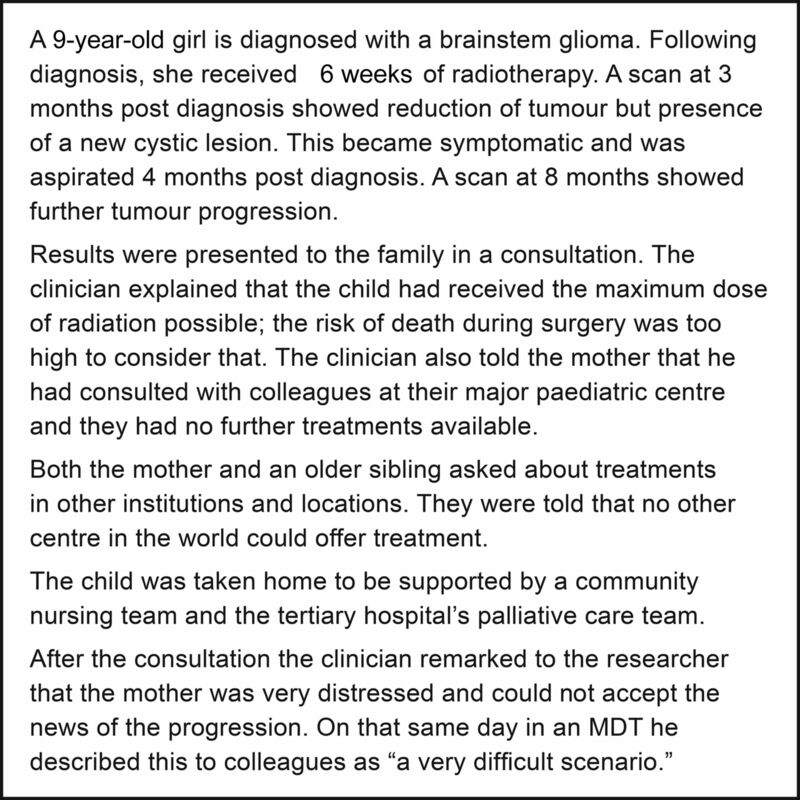 The mother and siblings raise the issue of proton beam therapy, something which the child had discovered herself online. The mother and the siblings and indeed the patient herself are looking for something to ‘try’. ‘Try’ is the word the mother uses, not ‘cure’. During the consultation the clinician reminds the family that he had told them at diagnosis that they could control the disease for some time, but that they could not cure her. The clinician also assures the family that palliation is not doing nothing. The child will be supported medically. Reassurances that symptom care will be provided, however, do not address the mother's drive to advocate for her child. She tells the researcher several times that the clinician has ‘closed the file’ on her daughter. She says that he ‘has made her dead’. Incumbent on parents is that they must leave no stone unturned.4 Their child's death must not be because of their failure or inaction. The sibling says: “Because we’re trying to find a different way too—because if you're going to help her like you say, like there's no—we're trying our best too, to not feel guilt, like we didn’t do nothing”. The clinician tells the researcher that he is distressed because he was unable to raise with the family issues about what care the child might need in the near future and how the family will respond. During the consultation, the family and clinician display differing perceptions of the clinical status of the child. The mother sees her daughter as ‘strong’ and ‘clever’. She has deficits as a result of treatment, but these have become integrated into a redefined view of normal. The mother enters and then prematurely exits the consultation with the view that her daughter's state is stable. The clinician presents the child as having disease progression. The clinician assessment is based on clinical findings, especially the scan. The mother's view is driven by significant disease-related experiences. To date there have been no such new experiences that would alter her view. The child has progressed in the clinician’s view, but the child and family have not advanced on the biopsychosocial illness trajectory. Our perspective suggests that this is possible since factors that drive the clinician’s view and those that drive the family’s views are different. The differences in the way the child is represented in this consultation make further negotiation about what to do going forward difficult. The current case illustrates how differences between families and clinicians can emerge in a consultation. We see how these can be attributed both to what the parties bring to the consultation and to what emerges during the interaction in the consultation. We have identified, using our perspective, two important factors in the case at hand. The first factor is which horn of the dilemma each wants to address at the outset in the consultation: the disease-directed horn or the overall well-being horn. The second factor in this case is the way that clinicians and families perceive or do not perceive significant changes in the child's status. The clinician was anticipating, hoping that the family would align their views with his as a result of his forewarning of disease progression at diagnosis. One cannot assume that both parties will arrive at the same point at the same time. Their views are not driven by the same factors. The dilemmas which clinicians and parents face are part of the fabric of their lives and their relationship. Parents have dual goals, seeking both disease-directed and symptom-directed care.4 ,10 Clinicians do as well. They treat disease, but they also look after the well-being of their patients and, when that is a child, the family as well. Applying the perspective presented above, we see how an interaction and, in turn, a relationship can break down. Each party needs the other in order to reach their common goal: to give the ill child the best that is possible. Each party needs to have their roles and their understandings of the situation at least implicitly acknowledged by the other party. When this ceases, interaction is no longer truly possible. An impasse is reached. This suggests the need to enter the consultation with awareness of the dilemmas clinicians and parents face as well as the need to maintain that awareness in the conversation that ensues. This will help to avoid a fractured relationship which adversely affects the care of the child and the parents' well-being in survivorship or bereavement. We need to rehearse our actions and our message. We need to carry into the consultation an awareness that this is a two-sided negotiation. We need to speak and act in a way which prevents breakdown of the consultation and the relationship (see figure 2). Such diligence will lay the foundation for making decisions we can live with—for we will have done all that is within our power to do. The authors are grateful to all the clinicians, parents and children who participated in the studies described in this article. The authors would also like to acknowledge the contribution of Jessica Russell to the case described in this article.
. The private worlds of dying children. Princeton University Press, 1980.
. In the shadow of illness: parents and siblings of the chronically ill child. Princeton University Press, 2000.
. Involving children with life-shortening illnesses in decisions about participation in clinical research: a proposal for shuttle diplomacy and negotiation. In: Kodish E, ed. Ethics and Research with Children: A Case Based Approach. New York: Oxford2005:323–44.
. Insuring the highest standard care in children with relapsed disease: towards an integration of palliative care in paediatric oncology. Queensland, Australia: Australian and New Zealand Children's Haematology/Oncology Group 2012 ASM, 2012. Contributors MB-L, DH, EMH and RL have made substantial contributions to the conception or design of the work, or the acquisition, analysis or interpretation of data. MB-L, DH, EMH and RL have been involved in drafting the work or revising it critically for important intellectual content. MB-L, DH and EMH and RL have approved of the version submitted for review. MB-L, DH, EMH and RL have agreed to be accountable for all aspects of the work in ensuring that questions related to the accuracy or integrity of any part of the work are appropriately investigated and resolved. Funding The research for the case presented in this paper (Figure 1) was supported by the Health Foundation [grant number 7211]. MB-L's post is funded by the True Colour's Trust. DH's post is funded by the National Institute for Health Research Biomedical Research Centre at Great Ormond Street Hospital for Children NHS Foundation Trust and University College London. EH's post is funded by the Louis Dundas Centre Programme Grant. Ethics approval Each study mentioned was approved by the appropriate ethical review committees of the institutions where the research was conducted. All clinicians, parents and where appropriate patients agreed to participate.